Cape Cod sea turtle release: An intern perspective. 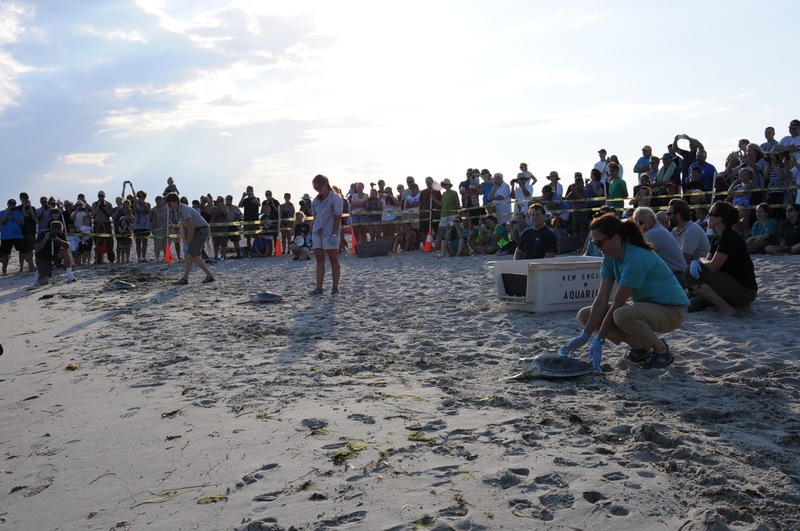 One of our summer interns, Ava, is guest blogging about her experience at the last turtle release. 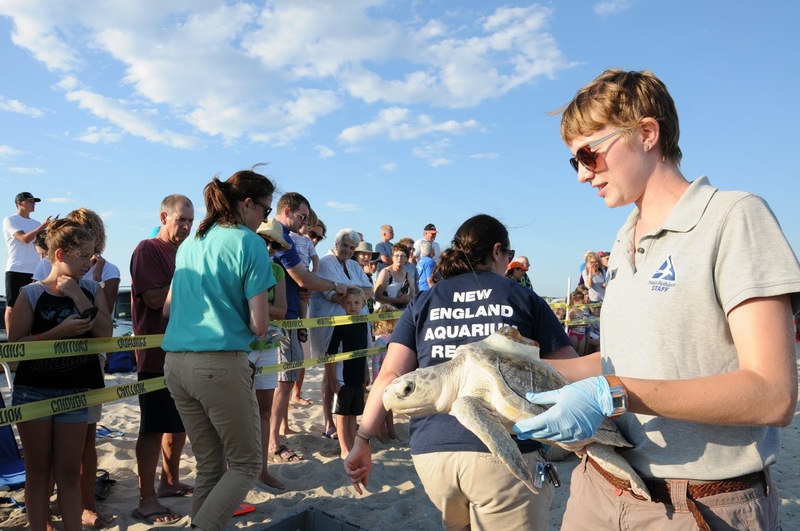 If you are interested in becoming an intern for the New England Aquarium, please visit our Get Involved page. Keep reading for Ava's experience! 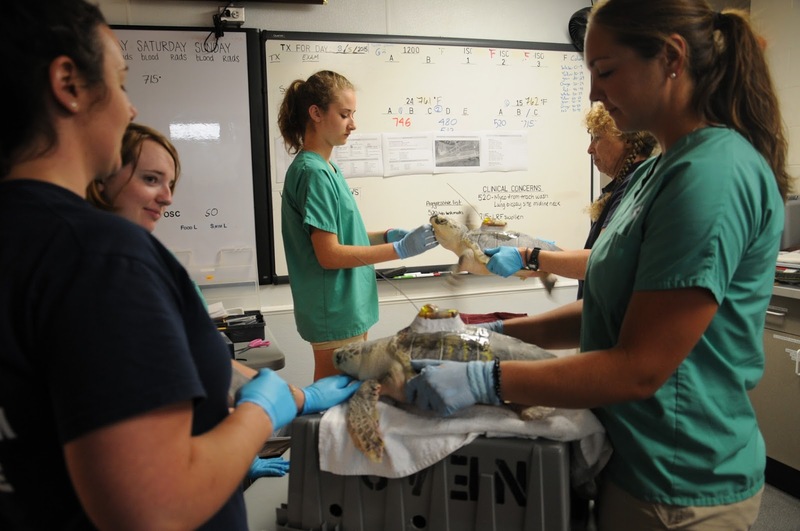 Visitors to the Aquarium on Central Wharf can dig into the turtle rescue experience at our Sea Turtle Hospital, compete with replica sea turtles that you can feed and diagnose. Buy tickets online today and you won't pay a ticketing surcharge. The release preparation was an intense process that entailed the hard work and dedication of staff, volunteers and interns. The staff spent hours upon hours planning the release. From ordering and testing tagging materials, sanding down the turtles’ shells, planning the placement and orientation of the tags, coordinating volunteer schedules and everything in between, it was impossible not to admire their dedication and understood responsibility to these animals. 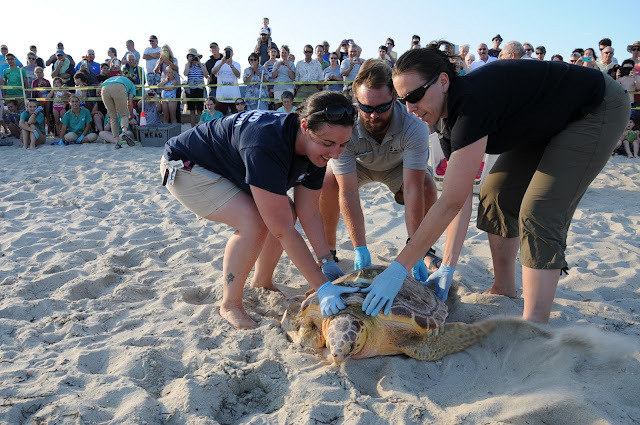 The loggerhead was tagged the day before the release, a process that took about three hours. I followed the lead of seasoned volunteers who knew exactly what to do in almost every situation. Tagging stations were set up throughout the clinic where volunteers and interns were in rotation—holding and restraining turtles as they received their satellite tags. 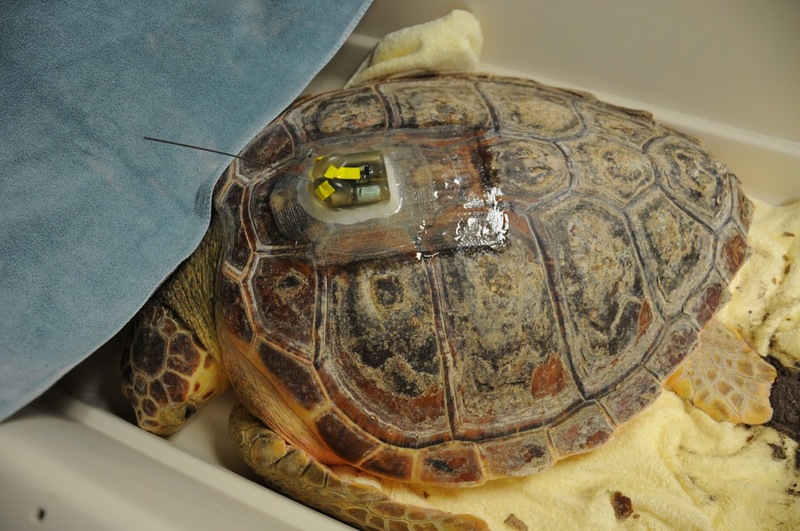 Once all the turtles were tagged and the epoxy had set, they were put back in their temporary habitat in order to allow them to calm down before the transport. I and other volunteers took shifts observing their behavior, intervening when they attempted to bite each other’s tags. 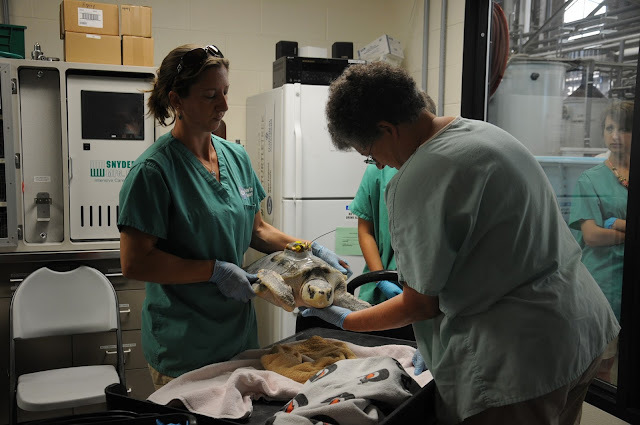 When it came time to get the turtles into the truck for transport, the loggerhead required the strength of three people including myself to get him into his transport bed. The other three turtles were put in the standard turtle boxes we used during exams and procedures, lined with towels and cushion. Once all four turtles were in the back of the suburban, we were on our way. I sat in the back with the turtles, climbing back every time White crowned sparrow tried to climb his way out of his box to get him back inside. 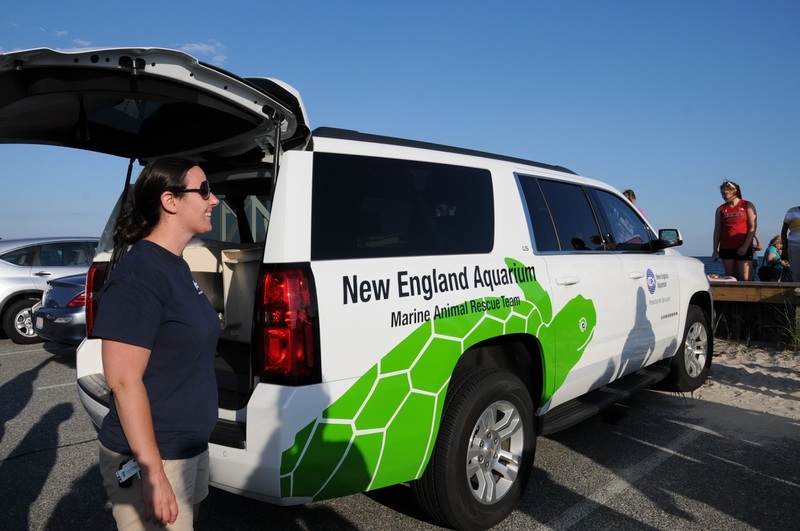 Senior Biologist Linda Lory in front of the new Rescue team vehicle. I watched as passerby’s looked confusedly at the giant turtle decal on the side of the truck. On our way to West Dennis Beach on the last day of my internship, a feeling of pride and appreciation came over me. I felt so lucky to have been able to spend my summer working with such amazing people and animals alike. 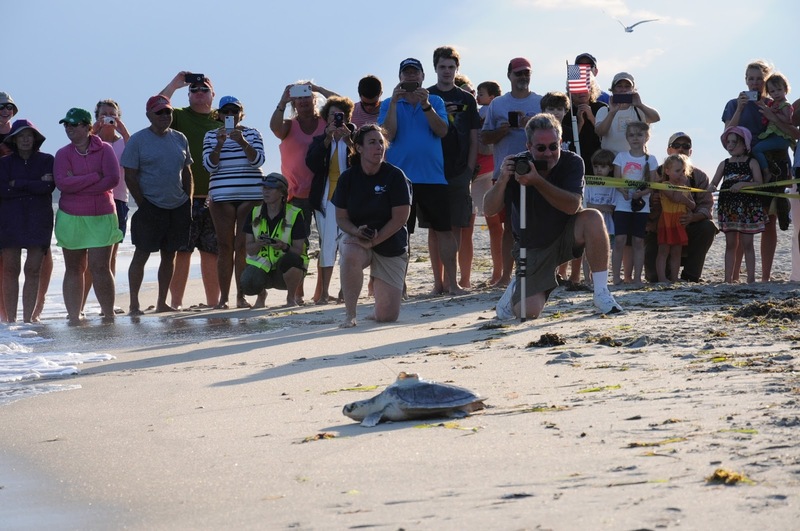 When we arrived at the beach, people crowded along the barrier where we were to release the turtles. A volunteer named Maggie and I carried out two of the Ridleys in their boxes and some of our colleagues from Wellfleet as well as one of our veterinarians carried the smaller turtles around for the public to get a better look. After the “Parade of Turtles” as we so fondly refer to it, the three Ridleys were set on the sand and were cheered on as they scurried back into the ocean (all except one who was still recovering from his nap on the way to the beach, he needed a little more cheering than the rest). 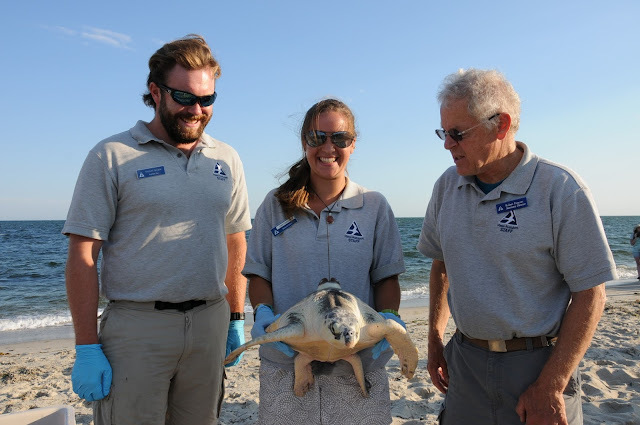 The picture above shows three of partners from the Wellfleet Bay Wildlife Sanctuary. 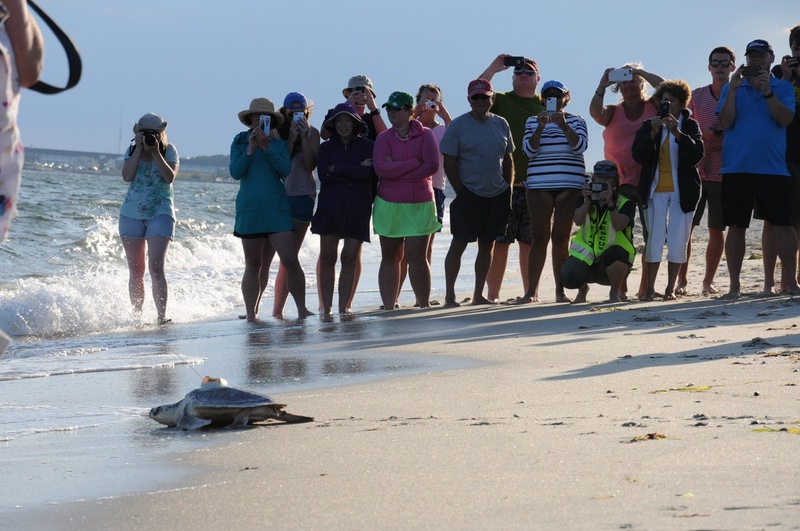 These are the hard working dedicated folks that walk the beaches to find the turtles when they strand. After the ridleys, the loggerhead was set on the sand and made his way to the shoreline. Just like that, they were gone. Collaboration at it's finest. 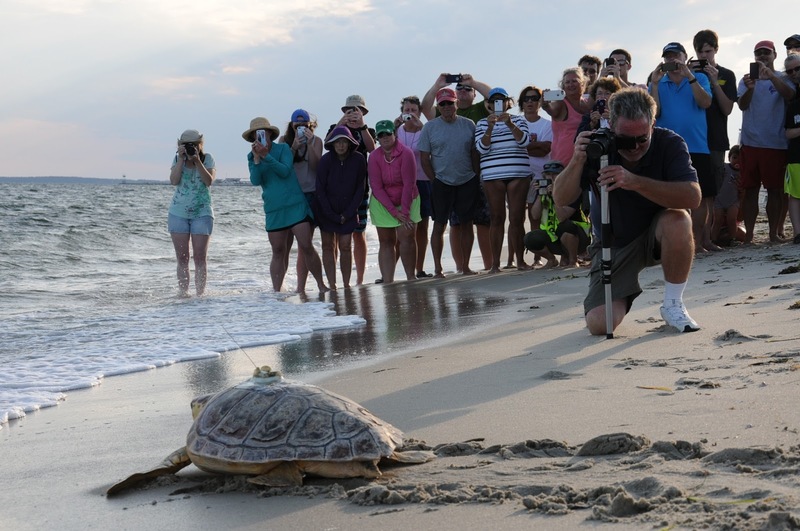 Above and below Aquarium, Wellfleet Audubon, and NOAA staff release the last cold-stun turtle of 2014, Snowy Owl. I couldn’t have asked for a better way to conclude my internship with the New England Aquarium. I was lucky enough to get to see the end result of all the work I did this summer. Luckily though, the staff at the Rescue Center couldn’t get rid of me that easily. 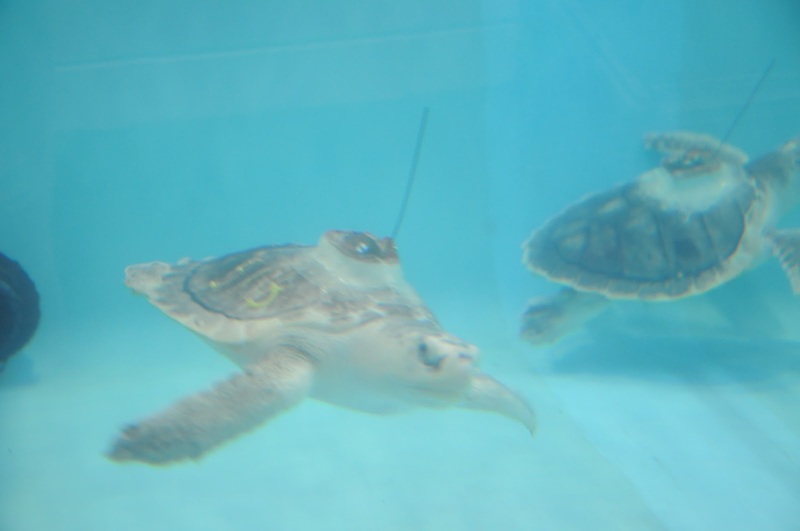 I am still volunteering at the New England Aquarium Rescue and we are already getting ready to meet the turtles of the 2015 season. To see where Common Eider (480), Yellow-bellied Sapsucker (513), White Crowned Sparrow (699), and Snowy Owl (734) are now either click on their "name" or click here to visit the seaturtle.org website. 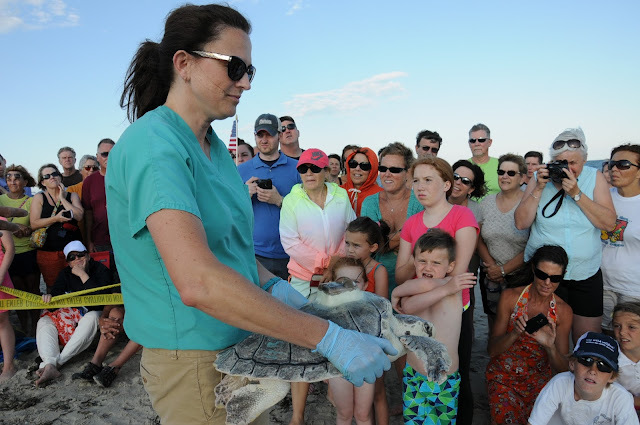 Thanks to Ava and all of the interns over the past months for helping with the extraordinary amount of sea turtles. 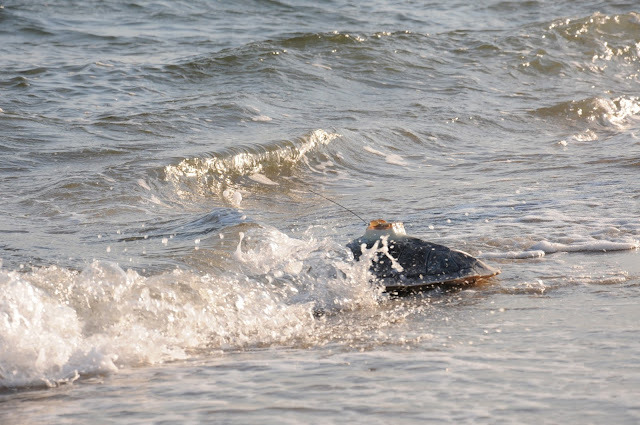 Preparation for 2015 turtle season is going strong! 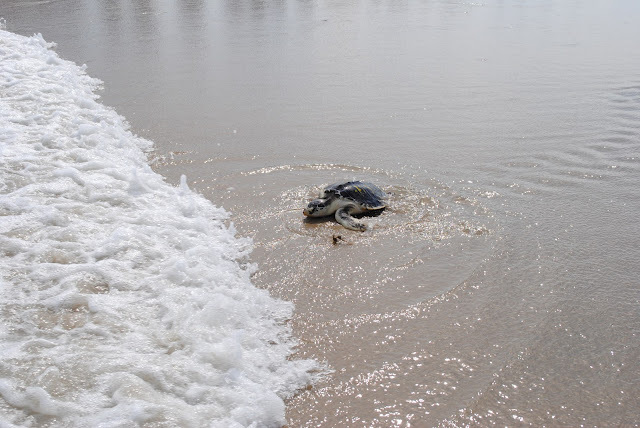 As staff are busy preparing and planning for another turtle stranding season, guest blogger Sarah will let you in on some of the building and office work that are underway. 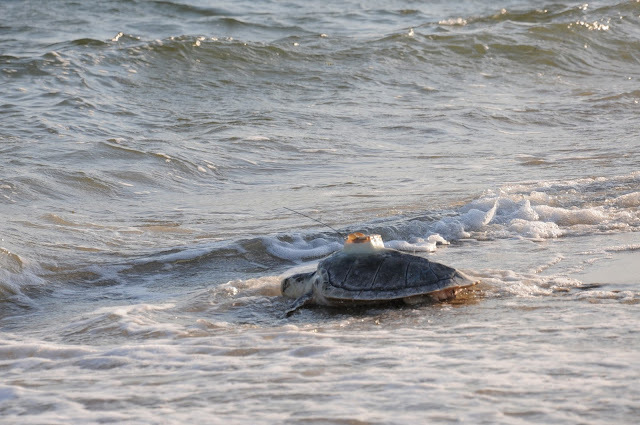 We may no longer have any turtles from the 2014 stranding season still in house, but this is no time of year to relax. As much as none of us want to admit it, it is beginning to cool off outside (maybe not during the day, but at least overnight temperatures are decreasing!). The end of the summer months means that the next turtle stranding season is going to be upon us before we know it. One of the last 2014 Kemp's ridley sea turtles return to the water at Assateague Island, Maryland. 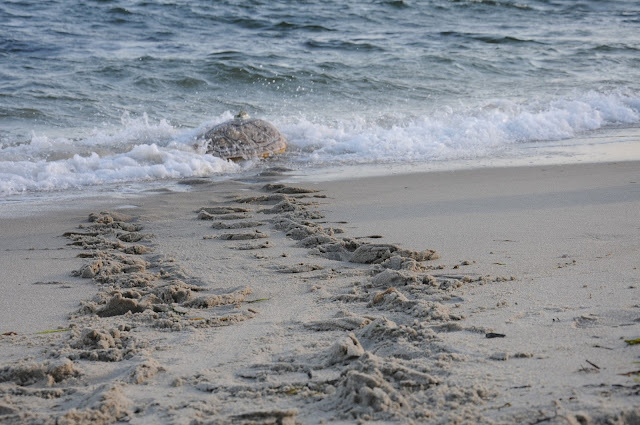 You can follow four of the turtles from 2014 here. We have been very busy here already preparing for the upcoming stranding season. Since the 2014 stranding season smashed our previous records, staff have decided to prepare for another monster year. Here are some of the projects we have been busy completing. Files for 1500 turtles are being made! Lindsay, Lena, and Liz are all busy getting folders and turtle bands ready for our arrivals. This is what 500 records look like. 1/3 of the way there. We need to make sure our towels are well stocked. Doing some repairs to tanks and life support. Installing new tanks and redoing the plumbing. Getting some support brackets ready for a chiller. Repainting and reorganizing our clinic. Creating an inventory of our loggerhead kennels. Sightings of loggerheads are up this summer. 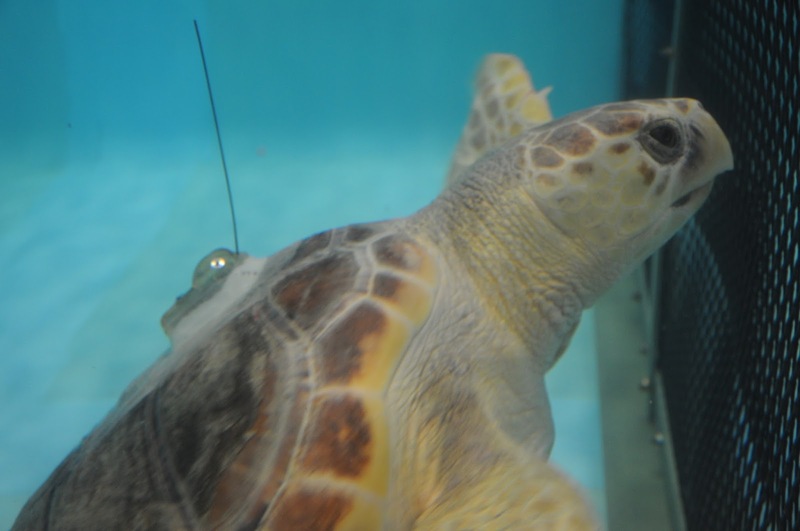 Early predictions are stating that we might have another big loggerhead year. As contrasted to last season where we only had 13 of that species come to the animal care center.